As the weather starts turning chilly, out come the coats and scarves to protect us from the elements. Fortunately, our dogs are much better equipped to cope with cold conditions than we are, as their thick coats trap a layer of heat close to the skin. That said, sometimes even these defences aren’t enough and dogs can become quite cold. Hairless and short-coated breeds, and dogs that are particularly old or young, are more susceptible to cold and may benefit from a coat or jumper in the frostier months. But when it comes to choosing a dog coat, what features are worth having and which one do you go for? Weather-proof ability – definitely worth having if you’re an all-weather walker. Reflectiveness – if you can find a coat that combines reflective features then it’s a sensible thing to have. You’d only need to invest in them separately otherwise. Space for harness – many people use harnesses now instead of collars, so it’s worth finding out if there’s an insert in the coat for the harness/lead to pass through. 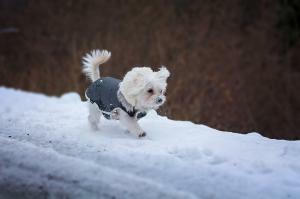 So now you know what you’re looking for, here are our ‘top picks’ for doggy jackets this winter. Measuring up for one usually involves measuring from the nape of the neck to the base of the tail, although every jacket is different, so you will need to read the product page before selecting a size. WeatherBeeta Parka 1200D Deluxe Dog Coat – another fashionable favourite, this dog coat has all the key features including a strong, waterproof outer, a belly wrap closure for extra warmth, a high collar to keep out draughts, and a reflective strip down the back for good visibility. Also available in a selection of great colours! WeatherBeeta Reflective Dog Coat – perfect if safety is at the forefront of your mind when out walking, this jacket is fully reflective to ensure your dog is seen even in the worst visibility. While it isn’t completely weatherproof, it is shower-proof so will keep the worst of the weather off your pooch. WeatherBeeta Windbreaker 420D Deluxe Dog Coat – a heavy-duty jacket with tough, shower-proof fabric and a warm fleece lining to keep out the cold, this product is ideal for the winter months and the all-weather walkers amongst us. Its high collar also helps keep the chill off, and the belly wrap closure will ensure minimal flapping when walking in high winds. Dog Gone Smart Aspen Parka Jacket for Dogs – rated 5 stars by our customers, this award-winning coat is fully weatherproof with a soft inner lining with polyfill insulation and a warm and stylish faux fur collar. The reflective trim makes this a great all-rounder – perfect for all dogs this winter! I have a Goldie Oldie English Mastiff weighs 68. I can't find a coat to fit her could you guide me to one that will please. I had a XXXL which iv had to imprecise to fit her but short around shoulders and baby belly. She is a Rescue and I don't want her to suffer any more than she has. Thank you. I have an 11-year old rescue dog from Romania. He was a street dog there with no one to care for him. He has a few coats but at the moment he wears Equafleece (Google it). It is a lovely warm four-legged jumpsuit with a zip down the back for easy access for arthritic dogs. He loves wearing it on chilly and cold days. I shall look at the coats you've shown too.